LakeCountrywx: Wouldn't this be nice? 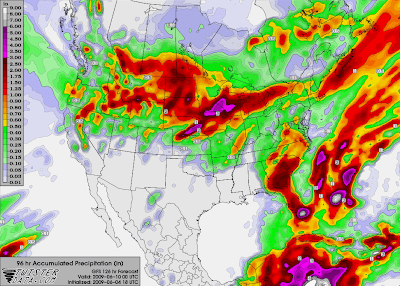 Yeah, that's the GFS 96 hour accumulated precip by about next Wednesday. I certainly hope for once that this isn't overdone. We need rain any way we can get it, fast, slow, whatever. If I were chasing the next 3 days, I would park in Colorado and stay there. Nothing seems a sure thing this weekend but after watching radar and live streams tonight, I would say Colorado would be a sure bet for the next couple days for some nice stuff. Probably would be alone in a sea of LPs. I've always wanted to chase out in eastern Colorado. Looks really inactive around here for a while, which is fine because I blew some of my chase funds on stupid chases the last couple weeks and there's a family to feed and work to be done... looks like I'm back to radar/stream watching for a while.